Catalogue No. : 16224 X.16 M.138 L.2. 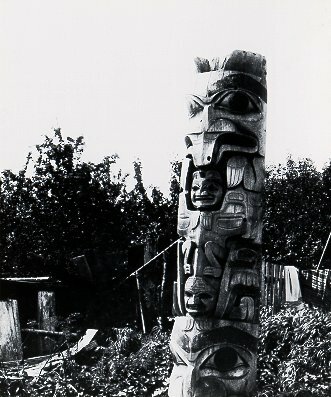 Pole at Skidegate now in Provincial Museum. See reverse of oversize for further information, some of this is in pencil and difficult to distinguish. House post at Skidegate, number 2 of Provincial Museum collection and the original of the Centennial Dollar design. Lantern slide catalogue credits Maynard with photo. old print also appears in album #1.